The YFCU’s popular ladies’ five-a-side junior and senior football final took place at the Balmoral Show. Senior teams and junior teams enthusiastically took to the cattle rings to battle it out for a place in the final. Both junior and senior teams played in their own league. At the end of each league, the top two teams from the junior and senior tournaments played against each other. 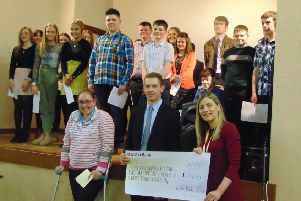 In the junior competition, Lisnamurrican YFC 1 and Killinchy YFC played against each other in the final. Lisnamurrican YFC 1 then triumphed to take home the junior title. Glarryford YFC and Lisnamurrican YFC 1 finished top in the senior tournament and played against each other in the final. Following a tense match, Glarryford YFC were announced as first place winners. The junior respect and fair play award was presented to Lisnamurrican YFC 2, with the Lisnamurrican YFC 2 senior team also collecting the respect and fair play award for the senior tournament. The YFCU would like to extend a note of thanks to the IFA referees for helping at both the competition heats and the final at the Balmoral Show. Thanks also go to all the stewards for their help in coordinating the matches.